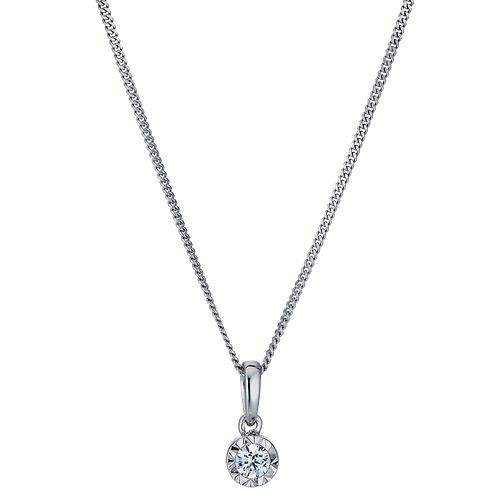 A sparkling 9ct white gold pendant set with a glittering illusion set Forever Diamond. The Forever Diamond has a unique flower cut made up of 73 facets for exceptional sparkle and radiance. Each Forever Diamond is independently certified by the GSI for colour, clarity, carat and cut. Your guarantee of quality and beauty. 9ct White Gold Forever Diamond Pendant is rated 3.7 out of 5 by 7. Rated 4 out of 5 by Anonymous from Bought for my partner on our anniversary Dainty but very nice a perfect gift for my girlfriend. Rated 2 out of 5 by Anonymous from Every small diamond Similar size available for less in other high street Jewelery may not have the described cut but I was dissapointed so returned it.